So I haven’t exactly finished my current velvet dress project but I’m already onto thinking about the next one. I saw this amazing dress in an etsy shop but unfortunately it is a touch too small in the waist (damn you 1950s sizing!) Also, I feel like I’ve seen a couple of sewing patterns for this type of dress and was wondering if anyone had any pattern suggestions to make this? But it got me thinking more about velvet and velveteen dresses and how they are both classy and super warm – which is important as we are heading into winter down here in the Southern Hemisphere. So here are some velvet dresses for inspiration. What ‘s your winter fashion fix? Have you seen the sewaholic Cambi dress pattern, the full skirt version is very retro. 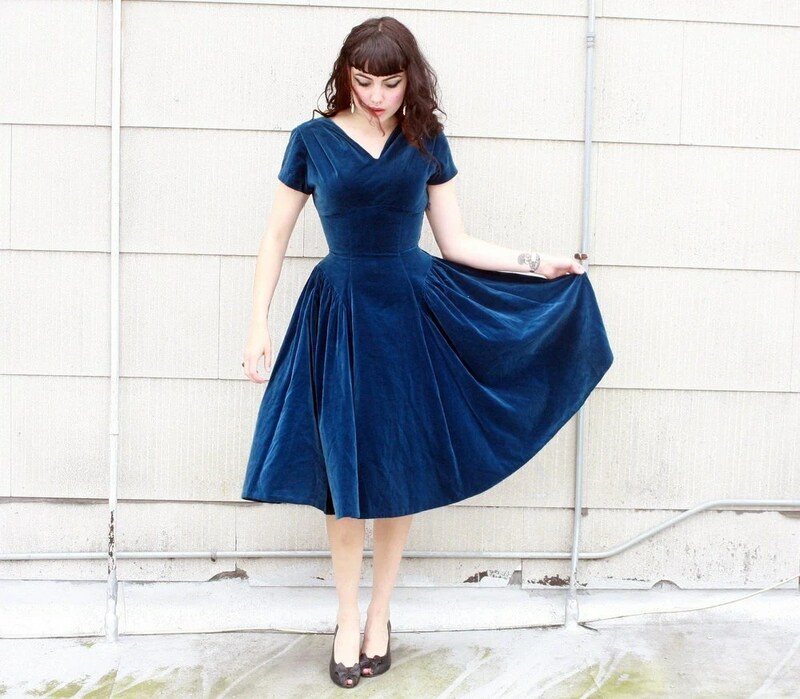 I love the idea of a velvet dress, I think I will have to make one now! hey, check out Vogue 8788. It’s a Vogue Vintage pattern original 1954 design but the sizing is more “current” (meaning the 70’s commercial pattern sizing…) I’m actually working on this after finishing Colette macaron..
Ooh! I have yards of green velveteen that I have been saving for years. I really need to make something out of it! I love that blue dress! They all look stunning but that first one is very classy. Sorry, not patterns to offer. I’m sure you will find one. Be sure to share a pic! I agree with everyone – the first one is divine. The color is just beautiful. I look forward to seeing your version! The 1st dress is my favorite. Love that color, too. I make all of my own patterns, but it’s hard for me to give advice unless I’ve been through the process of making it. Just make sure your velvet isn’t too thick if you are going to have gathers, otherwise it will be really hard to disperse them evenly. Me too! It’s all class right? That’s helpful advice – also wouldn’t it look really bulky?? I saw that first dress too and fell in LOVE! Good luck with your version – I am going to try and draft my own, although the combination of gathers and a shaped waistline is pretty scary. Have you sewn with velvet before? It’ll be my first time! I’ve sewn vlevet once before – I posted the result to this blog 🙂 Wow that’s so cool that you can make your own patterns! Check out the Retro Butterick line. They have a couple that might be just what you are looking for. Not sure if this is what you’re after – it’s a vintage pattern with a scoop neck and full skirt. That last one is a great looking dress! Good luck with finishing your first project! I toally agree – I love it!